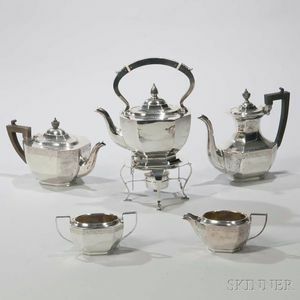 Five-piece Birks Sterling Silver Tea and Coffee Service, Canada, 20th century, each with paneled bodies, teapot, coffeepot, creamer, and sugar bowl each with an engraved foliate arabesque register to the neck, kettle-on-stand with burner without this register, kettle-on-stand ht. 13 in., approx. 100.3 troy oz.